Well, I survived my 41st birthday without incident. I am looking forward to another great year in my forties. The grey hairs keep increasing in numbers, but I am managing on keeping the wrinkles away for now. I feel great and am healthier than I have been in a long time, so that's always a positive. I thought I'd celebrate with some donuts. 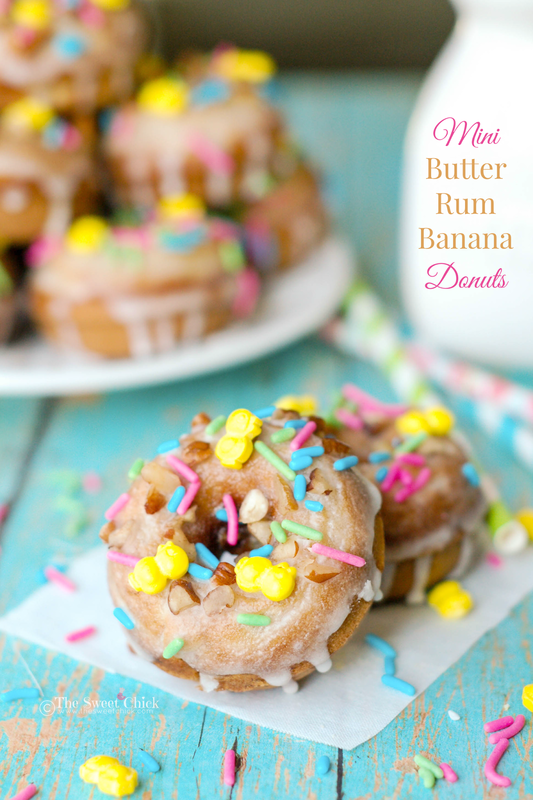 I know they are not completely healthy, but these Mini Butter Rum Banana Donuts are worth a celebration. These donuts were actually going to be muffins. I am always making my family muffins as snacks, so I wanted to change things up a bit. 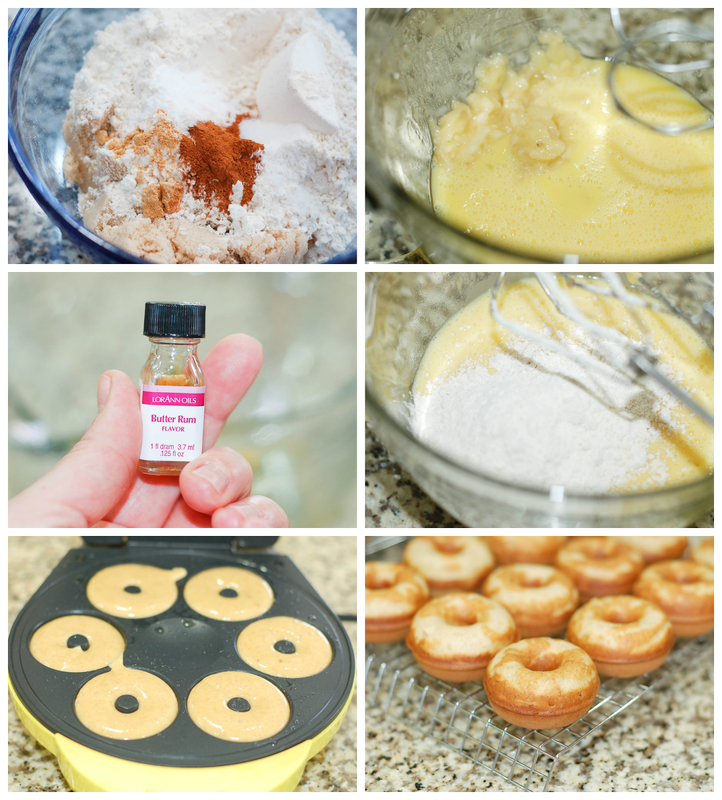 I was curious to see if my muffin recipe would work in my Babycakes Donut Maker. 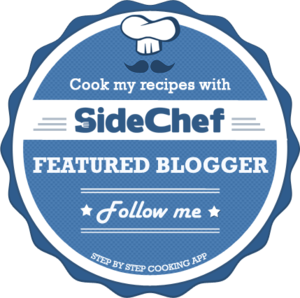 This recipe is based off my Strawberry Coconut Banana Muffins. I used the Butter Rum flavor of LorAnn Oils to add flavor. The same one I used for my Spiced Butternut Squash Cupcakes. A little goes a long way with these oils. They are more concentrated than extracts. The recipe is pretty simple, I didn't even use my stand mixer. I just used my hand mixer, then poured the mixture into my Tovolo Pancake Pen. I highly recommend using a pancake pen to fill up the donuts wells. It's faster and less messy. The texture of these mini baked donuts was moist and fluffy. The sweetness of the banana smoothed out the Butter Rum flavor and made it more buttery, a great match of flavors. I even added a little Butter Rum to the glaze and it was not overpowering. My daughter loved them. 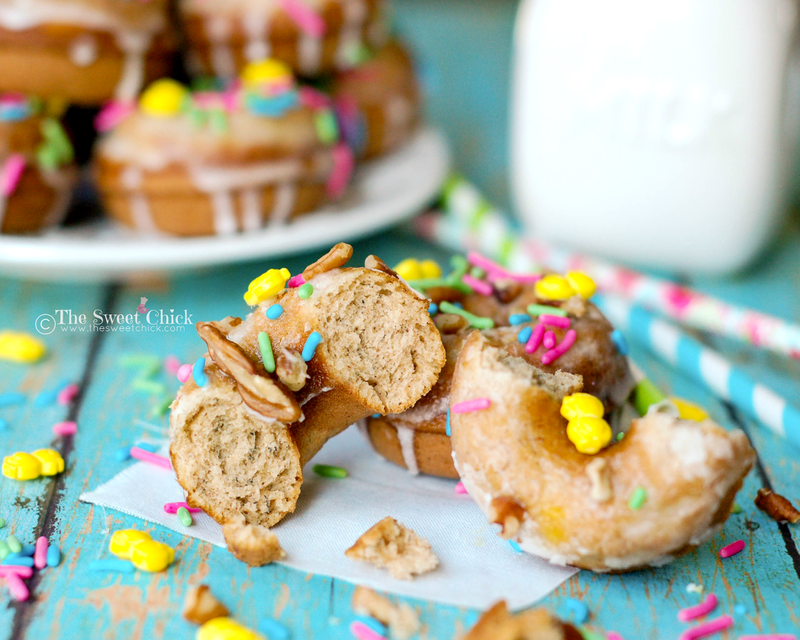 You can add chopped pecans to the top or sprinkles, or both. I found these Wilton Spring Chick Mix at Walmart. They were too cute to resist. 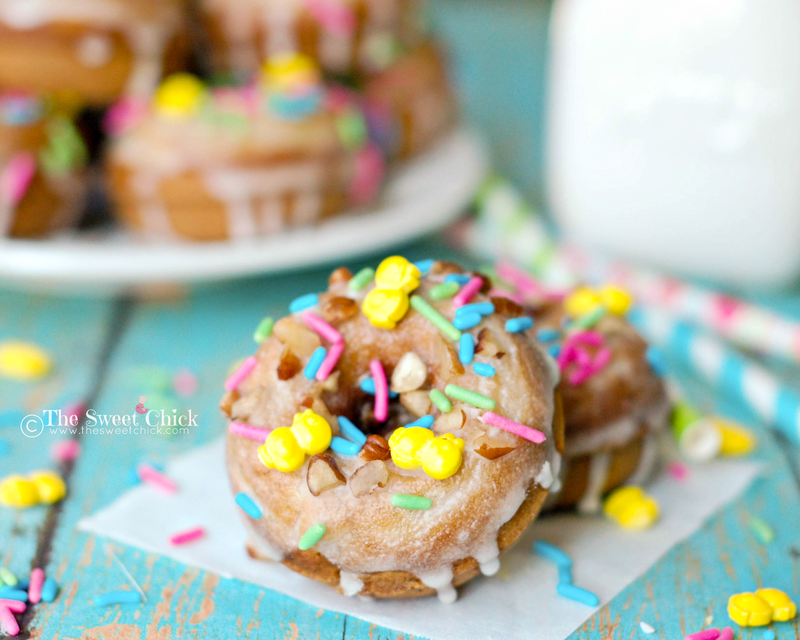 Whichever way you top them, these Mini Butter Rum Banana Donuts are a win. 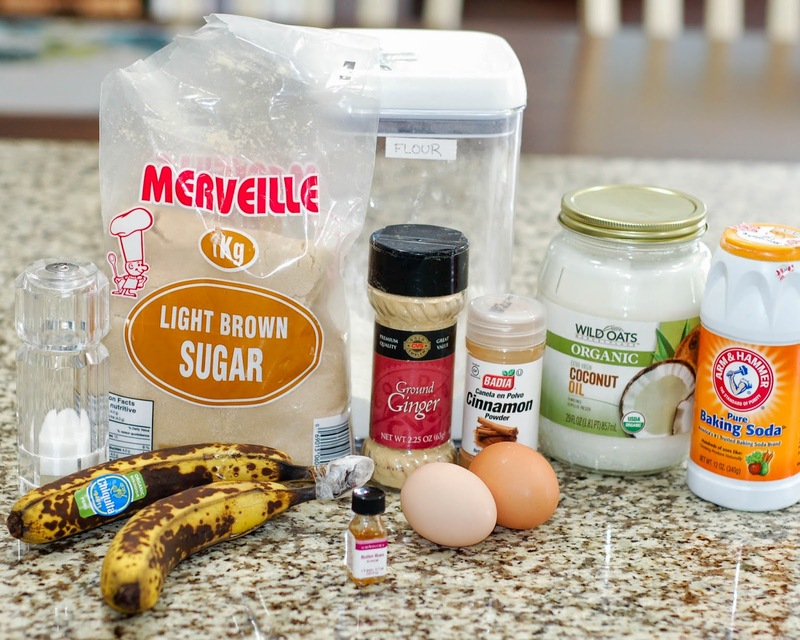 In a medium bowl, combine the sugar, flour, spices, baking soda, and salt. Place solid coconut oil in a microwave safe bowl and microwave for about 20-30 seconds until melted. In large bowl (preferably one that has a spout), whisk together the oil, eggs, and butter rum flavoring with a hand mixer. Add the mashed bananas to the egg mixture and mix well. Add the flour mixture a little at a time, mixing on low speed. Scrape down the side of the bowl as needed. Fill a pancake pen, piping bag or a Ziplock bag (with tip cut off), with the batter and fill each donut reservoir of your donut maker with about 2 tbsp of batter. Bake for about 3-4 minutes (I just used the timer on the donut machine) or until toothpick inserted in center of donut comes out clean. Place hot donuts on cooling rack with a wax paper underneath for when you are ready to glaze. If you are adding sprinkles or pecans, add them before the glaze fully dries. If you want to make these as muffins, bake at 375°F for 15 minutes or until toothpick inserted in middle of muffin comes out clean. You will have about 15 regular sized muffins.